We need to talk about Volvo. If you are thinking of tank like estate cars with earnest but outdated mechanicals you need to get down to your local Volvo dealership to sample the new approach that has brilliantly combined Swedish design with cutting edge technology thanks to a massive investment from Chinese giants Geely. The S90 is an excellent example of this new found swagger. Externally we think it looks great, having a clear identity of its own it is a breath of fresh air in the Executive market. Doing something different is easy but looking good as well is much harder and the S90 nails both. Amazingly Volvo has pulled the same trick off inside; the dashboard is stylish, well laid out, and features high quality materials. The good news continues with the drivetrain which is cutting edge. Here you get a direct injection 2 litre turbo and supercharged petrol engine which produces a very impressive 298 bhp. This drives the front wheels via an 8 speed automatic gearbox. A compact electric motor drives the rear wheels contributing a very useful 177 lb ft of torque. In between the two sits the newly enlarged 10.4 kWh (gross) battery which occupies the space normally reserved for the transmission tunnel in rear wheel drive cars. Positioning the battery pack down the centre of the car does restrict leg space for anyone travelling in the central 5th seat in the back, but it has the big advantage of allowing a full sized 60 litre fuel tank and a full sized boot (500 litres) which are both commonly reduced in plug-in hybrids. It also positions the batteries as far away from an accident as possible, which is nice. On the move Volvo has wisely chosen to prioritise comfort over any sporting intent. To be fair it would be a task to turn the 2 tonne S90 into anything else, but Volvo has nailed the brief, the ride quality is excellent particularly with the optional air suspension, whilst road and wind noise are very well suppressed. When the S90 is running in electric mode there are few cars at any price that offer a more relaxing environment. Speaking of modes, there are as ever several to choose from via a rotary selector including AWD, Pure, Hybrid and Power. You can also select Hold to maintain battery charge for later or Charge which uses the petrol engine to produce electricity and recharge the battery, but both of these functions are selected through sub menus via the touch screen rather than the rotary controller. We would prefer to have a physical button instead as it is a bit of a faff. As ever with plug-in hybrids, the fuel consumption you can achieve is heavily dependent on how much use you can make of the electric range. In this instance the S90 has an official WLTP range of 28 miles and we found this was pretty close to the truth as we managed 20 – 22 and can see how 28 would be doable. Another pleasant surprise was the mpg when running in hybrid mode. Across a week where we spent around 80% of the time on motorways (not great for a plug-in hybrid) we got 53 mpg which is an excellent result for a near 300 bhp, 2 tonne petrol car. The S90 Twin Engine combines a usable electric range, with very good real world mpg in hybrid mode. We are always looking for cars that are entertaining to drive, and the S90 isn’t that, but we also like cars that pick one thing to do very well and deliver. In this case if you want a cosseting executive saloon the Volvo is top of the pack delivering an incredibly refined driving experience. 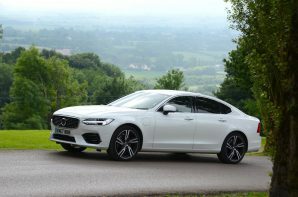 The money might be from China but the S90 delivers a uniquely Swedish interpretation of executive motoring with an environmental concussion, and we really rather like it!